Vivint’s team monitors your home 24 hours, 7 days a week, 365-1/4 days a year (and all day February 29 in leap years when there are 366 days). The entire system is wireless, so no need to worry about intruders cutting wires or any such nonsense. A touchscreen mounted on a wall in your home allows for easy access to your security settings. Create nonemergency alerts that tell you when an event occurs, such as when a certain door, like the one to your toddler’s room, is opened or closed. Motion detectors let you know when activity is taking place in a part of your home that you want to keep an eye on. Receive text alerts when potential problems arise, such as a smoke alarm being triggered or the system’s alarm going off. Vivint Sky is Vivint’s smart home technology that you can control from your touchscreen, smart device, or computer. 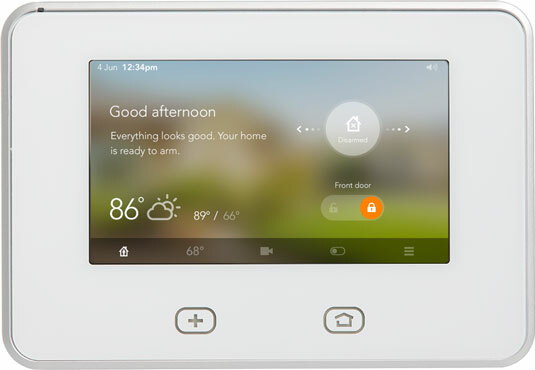 Credit: Image courtesy of Vivint, Inc.
1 touchscreen, which utilizes the Vivint Sky technology for making and changing settings to your system. 1 Vivint yard sign (it’s a high-tech one, I’m sure). 1 key fob, which allows you to arm or disarm your system, and to even call Vivint, without having to use your smart device or touchscreen. This really comes in handy if you’ve left your smartphone at the office. 3 door/window sensors, which alert you to when doors or windows open or close. Panic pendants, which you wear on your clothing or carry in your pocket. It can be used in case of an accident to notify Vivint you have an emergency, so long as you’re in range of your system. Glass-break detectors, which alert you to broken glass in your home. No, it won’t go off if you knock a glass off the kitchen counter, but it will monitor windows for breakage. This is a pretty neat and unique device: two thumbs up. As of this writing, you’ll find a chart on Vivint’s website that compares its offerings to other home security providers, but pay it no mind. Either it’s simply outdated and needs revision, or it is comparing apples to oranges. For example, the chart claims that Vivint provides a touchscreen panel and ADT does not, but that is not the case. There are other such discrepancies in the chart, so simply pay it no mind in determining which company you’ll want to use for monitored home security options.